Environment: In manganese deposits at Langban. Locality: Sweden, Värmland, Filipstad, Långban mn Link to MinDat.org Location Data. 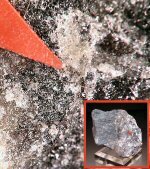 Comments: Yellowish glassy grains of adelite to 1mm in matrix. Location: Langban, Filipstad, Varmland, Sweden. Scale: Sample Size 6 x 6.5 x 4.5 cm. Color: Blue gray, Green, Gray, Yellow, Light green. note: Specific Gravity of Adelite =3.76 gm/cc. U=PEAdelite x rElectron Density= 92.10 barns/cc.